New Olympic Campaign Logo, Theme, Social Media Platforms “PlayBall2020.com” and Vision to Give Every Boy & Girl Chance to Play Ball also Launched. Join the PlayBall2020 Lineup on Facebook and show your support! The campaign was launched in Tokyo, one of the global power centres for the two sports. It followed an historic vote by international baseball and softball federation leaders and delegates worldwide – from Afghanistan to Zimbabwe, including China, India, Ireland, Iraq, Iran, Russia, Iceland, Nigeria, Pakistan, South Africa and many other nations - to ratify a landmark constitution that unites the International Baseball Federation (IBAF) and International Softball Federation (ISF) as a single new international sporting federation, known as the World Baseball Softball Confederation (WBSC). The birth of the world's newest international sporting federation is a milestone in the campaign to rejoin the Olympic Games sports program after being delisted in 2005. President Fraccari said the international baseball community was “honoured and humbled" to have the opportunity to rejoin the Olympic Games in 2020, and thanked the IOC for guidance and trust provided in forming the new federation, which he said would “provide greater support and resources for the athletes and help to develop the sports”. Fraccari continued: “We are on a great journey to return our global sport to the Olympic stage. We’ve been listening and learning from the Olympic Family and the IOC to understand what it takes to be included as a sport at the Olympic Games." "This is in the best interests of the athletes and putting the welfare of the athletes and the future of sport first, and inspiring young athletes to stand on the highest podium that an athlete can aspire to—the Olympic Games," he said. "We have reached a milestone in our journey to put baseball and softball back in the Olympic Games, and today I am proud to announce that the full membership of the International Baseball Federation voted to ratify the new Constitution of the World Baseball Softball Confederation." The WBSC also outlined its unique vision for the campaign. “Our vision is to give every boy and girl in the world a chance to play baseball and softball and to inspire them to take up the sport through the Olympic Games,” said ISF President and WBSC co-President, Don Porter. “Baseball-softball is a game that anyone, anywhere can play. There are no barriers to participation. If you’ve got a bat and ball you can play, regardless of age, gender, social, cultural or economic stature. “Baseball and softball help to empower women and provide pathways for women and young girls to experience and participate in sport in all cultures,” said Porter. The WBSC also revealed the theme for its Olympic Games campaign, “Swing for the Fences,” heralding a global call-to-action for baseball and softball players, supporters and teams to rally behind the Olympic Games bid. A new website for the campaign was revealed: PlayBall2020.com. Social media platforms to engage and enable baseball and softball communities worldwide were also unveiled to highlight the massive following the sports have and to share the passion to rejoin the Olympic Games. 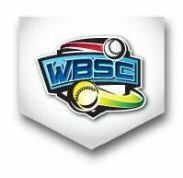 The WBSC’s new logo for the campaign was also unveiled. It symbolizes the unique appeal that has made baseball and softball among the world’s most watched, followed and commercially successful sporting brands and experiences. The new federation and Olympic Games inclusion campaign, has the support of players worldwide, and was launched by two of Japans softball stars, Yukiko Ueno, who pitched the Japanese team to the Gold Medal at the Beijing Olympic Games, and Nana Okamura, a new rising star who pitched Japan to victory in U16 ISF Softball World Cup and became the youngest player ever on Japan’s national team. The WBSC’s Olympic Games campaign is also supported by professional baseball and softball leagues around the word, including Nippon Professional Baseball, Major League Baseball in the United States, Korean Baseball Organization, the Chinese Professional Baseball Leagues, and numerous league partners in Latin America, Australia and Europe, who are united in their desire to participate in the Olympic Games. “I am sure that all of my counterparts in the professional leagues share our enthusiasm for Olympic baseball and softball,“ said Nippon Professional Baseball Commissioner and former Japan US Ambassador, Ryozo Kato, who said in an emotional address to the Congress, telling delegates that baseball had helped Japan to recover and grow after the devastation of the second world war, and was a catalyst for peace, uniting nations and people from diverse cultures and backgrounds. Worldwide respected Japan baseball legend, Sadaharu Oh, also made a strong personal appeal for support to get baseball back into the Olympic Games, while the President of the Japanese Olympic Committee and IOC member, Tsunekazu Takeda, said he would like to see the excitement and joy of baseball experienced by people all over the world, especially among young people.